Page added in May 2012. 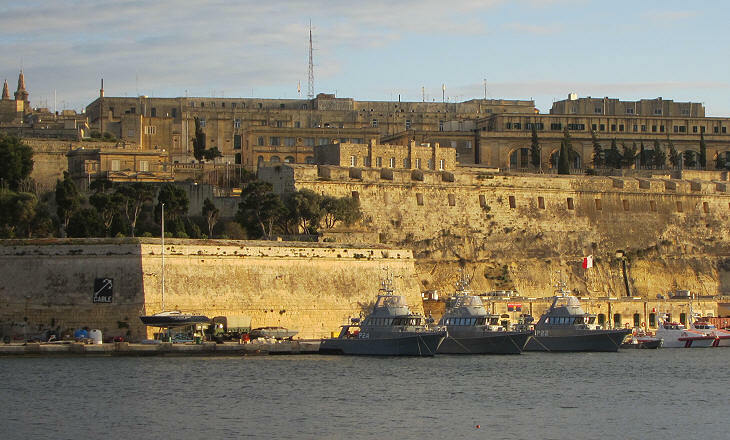 In 1634 Grand Master Antoine de Paule decided to strengthen the defences of Valletta by building a new set of fortifications to the south-west of the town. He was supported in his project by Pope Urban VIII who sent Pietro Paolo Floriani, governor of Castel Sant'Angelo and a military architect and engineer, to Malta. Maybe Grand Master Paule considered associating the settlement inside the new fortifications with his name, but perhaps because they were completed only a century later, the new town was called Floriana after the Italian architect. Paola is the name given to a town bordering on Bormla where in 1626 Grand Master Paule built a countryside residence. 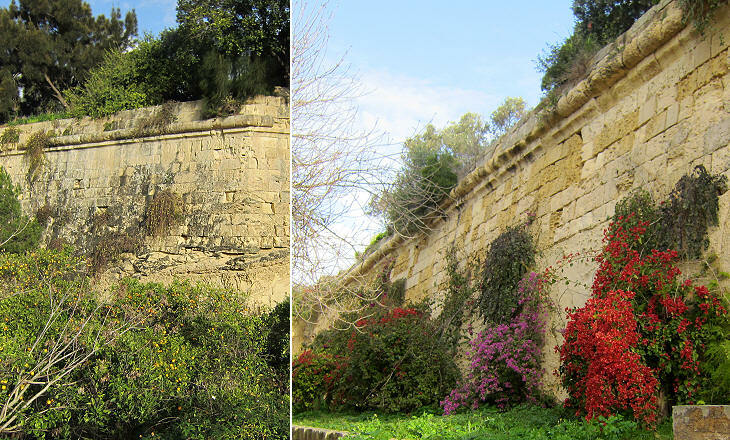 The system of fortifications designed by Floriani was similar to that of Valletta with a series of bastions and counterguards. The cost of such fortifications was so high that their construction was suspended several times until Grand Master Vilhena took resolute action to complete them. 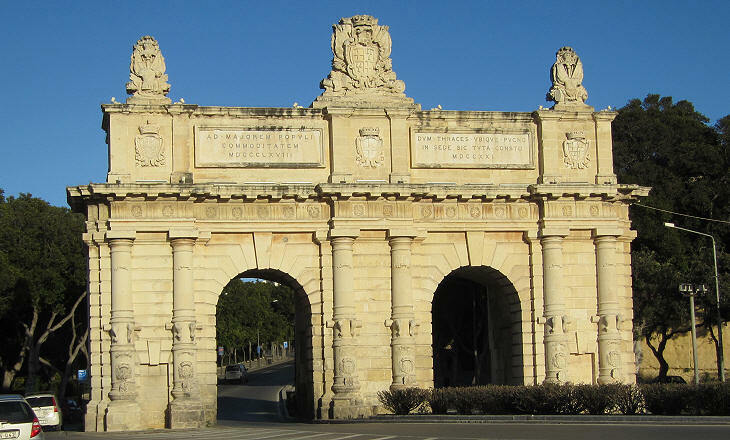 In 1721, before the completion of the fortification system, Grand Master Perellos built a grand gate which was enlarged in 1868 by the British government. At the time of its construction Porte des Bombes was accessed through a drawbridge across a deep ditch and was part of the walls. At the time Grand Master Paule decided to build the new fortifications, Floriana was a wide open space with a sort of gymnasium, in the sense of an enclosure where the Knights exercised. The enclosure was known as Giardini del Maglio, after an Italian game which consisted in knocking a wooden ball as far as possible with a maglio, an iron club. The game was known as pallamaglio (pall mall) and is a precursor of English croquet. 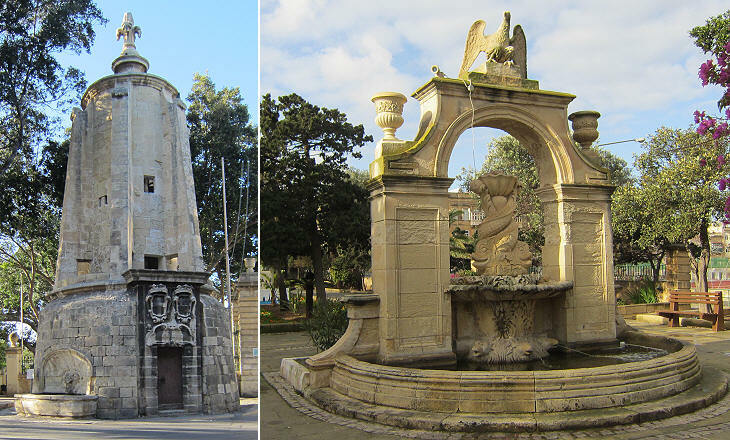 The enclosure was embellished with fountains built by Grand Master Alof de Wignacourt: one is decorated with a fleur-de-lys, the Grand Master's heraldic symbol, whereas the other one was probably dedicated to Paul V, the reigning pope, whose heraldic symbols were eagles and dragons (the heads spouting water in the lower part of the fountain were probably meant to represent dragons). The construction of the aqueduct was supervised by Bontadino de' Bontadini, an architect from Bologna. His appointment was likely suggested to Wignacourt by Evangelista Carbonesi, Inquisitor of Malta, who was from Bologna too. 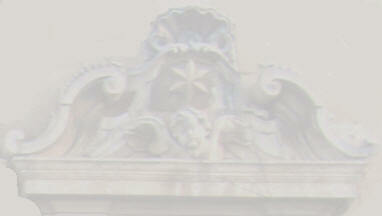 In 1675 Malta was struck by a plague which killed 8,000 inhabitants. Grand Master Nicolas Cotoner commissioned Mattia Preti and Lawrence Gafà the construction of a chapel dedicated to Our Lady of Good Help to celebrate the end of the pestilence. The chapel however retained the name of Martin de Sarria, a Spanish knight who built a previous chapel on the same site in 1585. It is an elegant building which has the circular (or octagonal) shape of many Italian chapels built in fulfilment of a vow such as Tempietto del Bramante. The urban layout of Floriana was designed during the first half of the XVIIIth century. 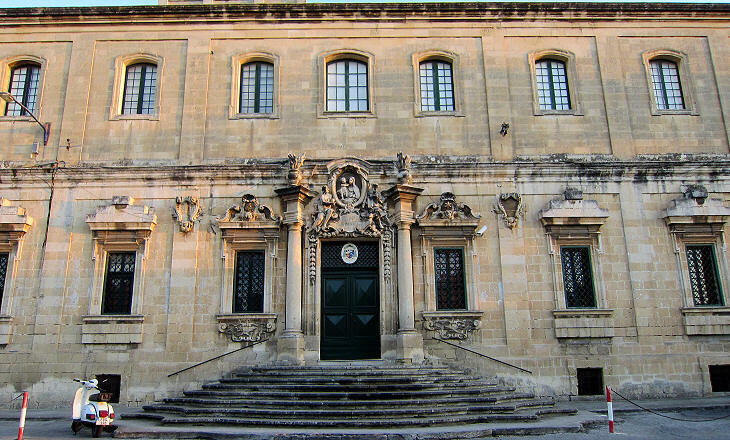 In 1743 the Jesuits commissioned Andrea Belli, a Maltese architect, a building for holding their Spiritual Exercises there. The choice of a location outside Valletta can perhaps be explained by the growing hostility the Order was facing throughout Europe and which led to the expulsion of the Jesuits from Malta in 1768 and to the suppression of the Order by Pope Clement XIV in 1773. Floriana became a separate parish in 1844. Its church was started in 1733, but it was completed only in 1885. 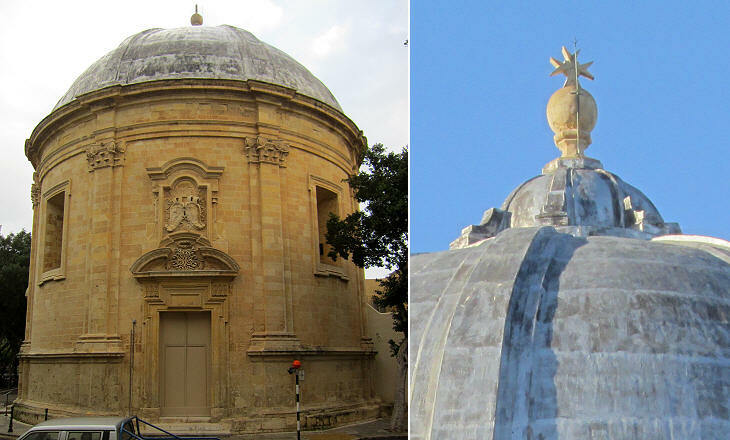 The building combines different styles and its size is an example of the sort of competition among the parishes of Malta at building the largest church. 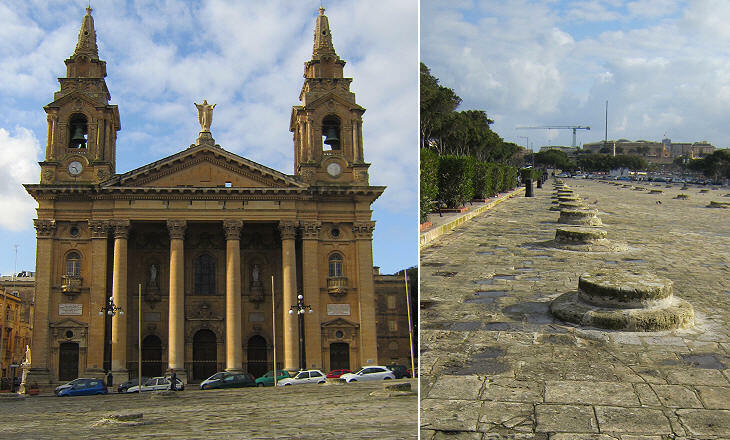 The competition developed towards the end of the XIXth century and it led to the construction of some gigantic churches, such as St. Mary's at Mosta and St. John's at Xewkija. St. Publius was the first follower of St. Paul who was shipwrecked on Malta in 60 AD. 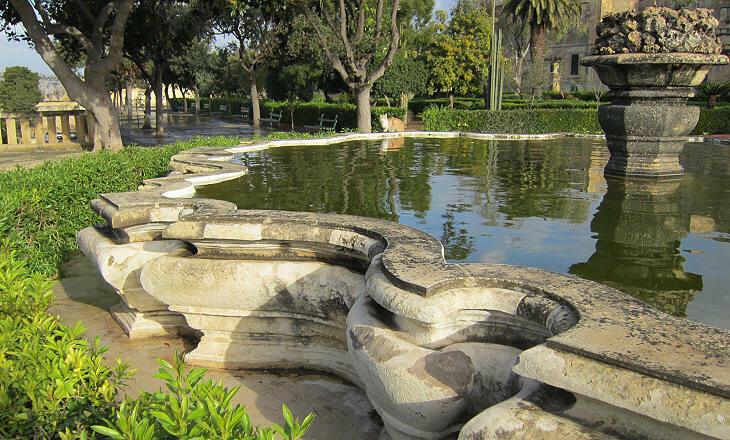 In 1855 the land surrounding a residence built by Ignatius de Argote, a Spanish knight of the XVIIIth century, was turned into a small botanical garden. 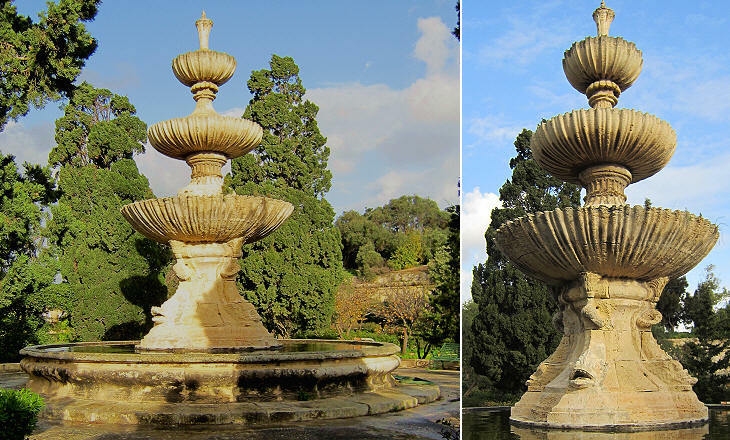 Later on it was embellished with fountains removed from Valletta, one of which had at its centre the bronze statue of Neptune which can now be seen in the Grand Masters Palace. The image used as background for this page shows a detail of Bishop's Palace.